Janet is usually quiet and reserved but today she surprised me. We went to Jimmy John’s to get sub sandwiches for our grandkids a while ago. On the sidewalk was sitting a young black man asking for money. I walked into the store but she turned around and went back to talk with him. 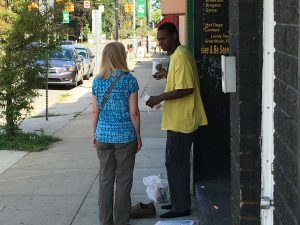 She said, “I won’t give you money but if you’d like a sandwich and a drink I’ll buy you one.” I was looking for her inside the store but didn’t see her so I went back out to see where she went. That’s when I got this picture.